April 23rd, 2015 - Oslo, Norway - The MØBEL INTERIØR Conference 2015, organized by the Norsk Industri Møbel and Interiør Association, took place in Oslo on April 23rd. Core themes of the conference were: global trends, incoming challenges for the furniture and interior industry in Norway and strategies carried out by representative furniture manufacturers and retailers. Professionals and market analysts were among the key speakers. 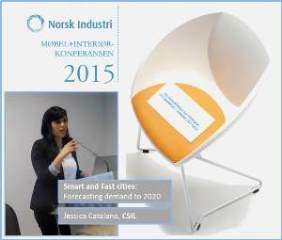 Ms. Jessica Catalano, CSIL partner, participated in this event on Thursday April 23rd, giving a speech entitled ‘Smart and Fast cities: forecasting demand to 2020’, focusing on the global trends of the furniture market and growing cities of potential interest for Norwegian furniture industry. According to CSIL report ‘Smart and Fast cities: forecasting demand to 2020’, Oslo is a dynamic and changing city. It is among the wealthiest cities in the world and one of the fast growing ones in terms of population. Residents in Oslo allocate a considerably large share of their expenditure for housing and utilities. With the aim of further improving the quality of life in the city, Oslo's government has undertaken relevant projects. The city is at the centre of Norway's national and international transport infrastructure and as such is easily accessible: Oslo airport is located just 47 km north of the city; also, the city has an important seaport which is home to nearly 900 companies and over 8,000 employees working in Oslo. In 2020, households' consumption is forecasted to increase by 30% compared to 2012. The largest contribution to this growth is expected to come from high-income households. Furniture demand in this city is forecasted to rise up USD 718 million, an increase by 22% compared to 2012.